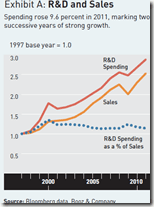 Booz Allen Global Innovation study shows rising R&D investments in 2011 … what about 2013? 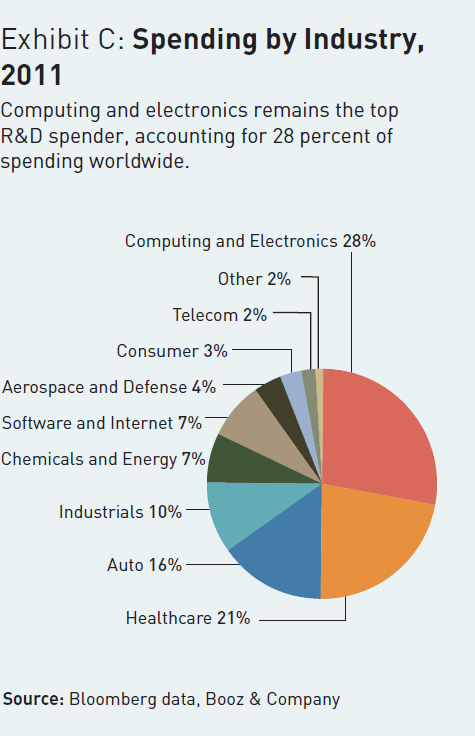 The global innovation report is a yearly report showing R&D spendings across different industries. 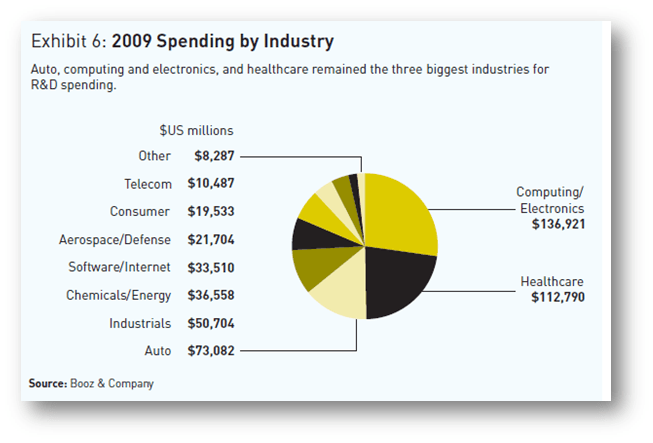 For reference, I have included the 2009 results by industry and the 2011 version below. The sectors which invest in R&D do not differ much from one year to another. Although the report states that R&D investments doesn’t always mean that innovation is produced, or that this innovation is performing better than other products investments diluted across other budgets, there a precious few metrics that make it possible for us to measure how innovation is faring. So we’ll have to make do with this. What the report shows as well is that rising investments mostly happe in America, whereas Europe was already deep in recession at that time. I can’t wait to see what the 2013 report will show. At last, the report shows a strong correllation between sales and R&D investments. One could read this either of two ways: when sales are good, R&D investments grow, or … when R&D investments grow sales are better. via R&D Spending Returns to Pre-Recession Levels, Finds Booz & Company Global Innovation 1000 Study | Innovation Management. In a previous series, Alban Fournier, a young French professional who fell in love with Asia warned us that China was the next worldwide International giant in the making. In this piece, he is expatiating on this previous report and delving into the details of what makes Chinese Internet players stand out from the crowd. What is currently planned at Alibaba, Tencent, Sina, and Baidu is worth further investigation, hence this sequel to my initial piece on Chinese Internet. My duty is to continue the story published last year and called “Chinese Internet industry ready to grow beyond borders”. People were quite sceptical in 2008 when I announced that China, as a country, was good at disruptive innovation following a trip in Beijing. At that time, I placed my bets on a Chinese Internet becoming almost the only alternative to its American predecessor. Who would have imagined that change would accelerate so much at the very beginning of 2012? China has the world’s largest Internet traffic thanks to its population, the world’s biggest with more than 1.3 billion people. With the strong increase of its Gross Domestic Product, extraordinary engineering talent, plenty of venture capital, Chinese entrepreneurs and large firms now have the necessary resources to compete worldwide. From a social behaviour point of view, there is a fundamental difference between American and Chinese people: in the U.S.A. (and in Europe too) a majority of online users are “spectators” while a majority of users in China are “creators”. China is therefore much more active market and its users generate a lot of UGC (user generated content) every day. This discrepancy is one of the reasons behind the success of QQ games, a Tencent service dedicated to free online gaming. Now that Chinese Internet players are giants at home, aren’t we just about to see them thrive beyond borders? In 2011, Tencent formed several strategic partnerships in China: among them, Kingsoft Corporation Limited, an Internet security software editor and eLong, Inc, a leading online travel service provider in China. Outside China, in addition of being active in the U.S.A., Russia, India, Vietnam, Thailand, Tencent acquired a majority stake in Riot Games, a Los Angeles-based developer and publisher of online video games. In 2010, Tencent invested $300m in Digital Sky Technologies (DST) of Russia, bringing two internet powerhouses of the emerging markets together in a long-term strategic partnership. Alibaba prepared the future of Alipay reaching an agreement with Yahoo!, and SoftBank. Alipay is a leader in China in providing payment processing services. Alibaba also developed operations in the U.S.A. and formed a partnership with Turkey’s Logo Group to reach Turkish companies. Among others, Renren and Dangdang are listed on the New York Stock Exchange. We can expect more US IPOs by Chinese companies. There are at least 10 Chinese Internet companies which have made confidential filings through the Security Exchange Commission. Those Chinese tech companies aiming at an IPO are also growing their business through innovation.